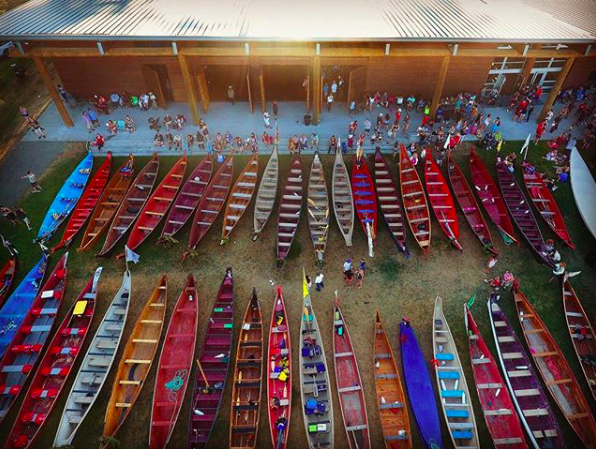 In August, fifteen thousand people welcomed more than one hundred canoes to Puyallup. It was glorious. I felt proud to be a Coast Salish woman. I felt proud to be born from these people. The Coast Salish Sea has always been known as the life blood of our people— Mish’s or ‘the people’ in Lashootseed belong to her— we know ourselves as “the people of the tide,” “the people of the clear salt water,” and other water- and land-based identities. This water provided life for us as we traveled our ancestral highways to maintain our vibrant economies, to ensure that our nation-to-nation relationships remained strong, and to keep us alive. The dugout canoe served as our vessel to travel long distances, ensuring sufficient quantities of food, establishing and renewing tribal alliances, and preserving social and ceremonial contacts, which in turn permitted our culture not only to survive, but to flourish. The canoe served as the locomotive engine to industrialization and provided the harmonious, potlatching way of life that endured for thousands of years. Our way of life remained until the colonizer arrived. At the turn of the 20th century, the federal government wanted our people to vacate our longhouses, to relocate to our 40 acres, and to distance ourselves from our traditional life-ways. We were meant to become farmers and assimilate to American culture. Indian agents were assigned to verify our level of assimilation so that we could be citizens. Many of our people refused. We liked our way of life. We liked living in longhouses, with entire families, feasting and laughing. The idea of a single-family house sounded absurd. Besides, we were fishermen. Become farmers? Pah, we refused to leave our longhouses. The cavalry responded by setting our longhouses aflame. Massive dwellings like Old Man House blazed in terror. Our ancestors fled to the islands in our canoes, pulling to safety from the cavalry (horses can’t swim as fast as canoes pull). The feds responded by outlawing our canoes, making it illegal for us to even be in them. They destroyed our canoes by burning them or sawing them in half. Even today you can visit our canoe bone yards in the woods. As they had destroyed our canoes, so too the feds declared war on our bodies, saying that any gathering of five or more Indians would be considered a war party. That is when “canoe life” went to sleep. Our lives were forever changed. With our homes destroyed and our vessels and food systems disrupted, we were left no choice but to move. We were made homeless in our own homes. In this Godless way, we Mish’s were forced to move onto reservations and there we remained until finally, through the Indian religious freedom act in 1979 we were legally allowed to return our spiritual vessels to the water. Fast forward ten years to the city of Seattle celebrating its centennial. The city officials called the indigenous people and asked for Native representation. Specifically they called upon Emmett Oliver from the Quinalt Nation. Imagine that, a city celebrating its colonial settlement and asking the very people they displaced to help them celebrate. The un-thanksgiving, if you will. But our elders went. They desired to resurrect those bones and reconnect with our stolen waterways, even if it was in the name of colonial positioning. They knew deep down that this was their platform for resurgence. In 1989, 17 canoes participated in the first Paddle To Seattle. I was just five years old. A few years later, our people paddled to Bella Bella. Every year since then, the “canoe families” have been paddling to a different host destination. Throughout my lifetime, I’ve paddled on various canoes. I’ve paddled with Alaskans, Tulalips, Nisqually’s, Quinalts, Urban Indian Inter-Tribal Canoes, and even some canoes in Haudenosaunee and Anishinabe territory. When I was a kid my Mom would always encourage me to go paddle— I’d always decline. I didn’t get it. I didn’t know that it was a privilege. It didn’t really fully sink in for me until two years ago when I was in Nisqually, and Hanford Mcloud told me the story of Chief Leschi. Of how he was hunted down and hung for refusing to sign the medicine creek treaty and wrongfully accused of charges he didn’t commit. What stuck out to me is the way that people came for him. Of how they circled the jail house the he was kept in. And how they kept the drum beat going for him until the day he was hung. On that day, Chief Leschi told the people that there would be a great loss ahead but to remember the water. To remember the mountain. To remember where we had come from. And that a day would come when our spirits would be strong again, and on that day, he’d be there with us. When hundreds of canoes landed in Nisqually, a chair stood, waiting for Chief Leschi. The canoe is more than just a vessel to carry our bodies; it carries the hope and resiliency of our people. We are living in a time of cultural resurrection, The Coast Salish sea beckons our bodies to commune with the ocean in our traditional way— to provide the lifestyle needed to feed our people. The elders say that our spirit gets hungry. Our spirit isn’t just hungry for food. It needs to be nourished by the sound of water pulling and drum beats tapping; it yearns for traditional Salish seafood that burns over open fires and emerges from beneath the smoldering ground; our spirit grows hungry for the feelings that can only be sensed in those spaces. Traveling these ancestral waterways reinstates our wholeness as a people. These spiritual voyages embody the resilience of indigenous sovereignty. This is a revolution. PS— For the past couple of years I’ve felt grateful to participate and witness the revolution. We’ve made numerous films about the journey, and we invite you to watch them here. But most excitedly, we are self-publishing a book, embodying the theme of last year’s journey to Puyallup titled “Honoring Our Medicines”. We will be doing a pop up exhibition of this show to celebrate the book at The Tacoma Art Museum this spring. Some of our favorite images are below! Please stay tuned! This entry was posted in Healthy Lifestyle and tagged Last Real Indians, LRInspire, Matika Wilbur by lrinspire. Bookmark the permalink.